Well-maintained 1.5 story with NEW ARCHITECTURAL ROOF in 7/17. 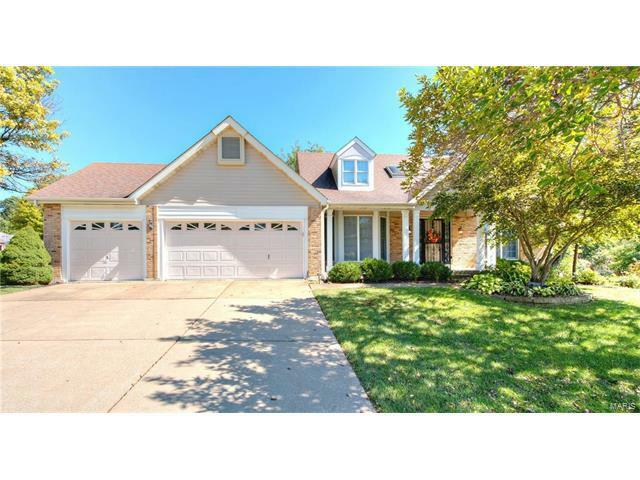 Large 3 car garage, main floor master suite, and 2 large bdrms on 2nd level, incl matching 2nd master BR w/wonderful private bath, separate oval tub/shower, and walk in closet. Entry has stately, 2 sty open view w/grand staircase, wood floors & soaring cathedral ceiling. Cozy living rm & formal dining rm adjacent to entry. Family rm with gas fireplace, wood floors, loaded w/ windows to bring the outdoors view "in" makes this a special area to enjoy. Open floor plan. Large kitchen is loaded w/cabinets, granite counter tops, tile flooring,& connects to the naturally lit breakfast area featuring bay entryway to deck. Main floor laundry area. Upper level has the 2 add’l large bedrooms and a terrific loft sitting area open to main level. Finished lower level w/ rec area/office plus plenty of storage. Freshly painted ceilings & deck, carpets cleaned.Seller can close as soon as you can.Move in ready! Hwy 255 to S on Telegraph 5 miles. Right on Tollgate at the stoplight, R on Wynfield Terrace Drive, L on Wynfield Terrace Ct, to first home on left.